My alarm sounded promptly at 5 am. Coffee deprived and still half asleep, I got in the car with Meg and made my way to Islamorada. As I began waking up, my sleepiness was replaced with excitement; I was going to shark tag today. It was my first day as an RJD intern and I wasn’t entirely sure what to expect. I had done this before, or something similar to it, in the Gulf. Today the RJD team welcomed our first shark of 2013, a large male nurse shark! Upon leaving for today’s trip we were not sure if we would even catch anything. Although Captain Curt always delivers, everyone was a little apprehensive about his decision to fish at a brand new site rather than the very fruitful Middle Grounds. After about a 30min ride out, we arrived. 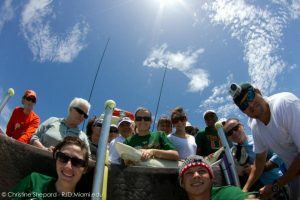 Today the RJD team and I had the pleasure of fishing with Miami’s own MAST Academy, and the one and only Greg Markham. Expectations were high as we set out to the same spot from the day before where we caught 5 sharks. We were heavily staffed so the ride out to “Curt 1” (Captain Curt’s top secret fishing spot in Everglades National Park) went smoothly as bait crates and drumlines were prepped in record time. Time to Fish. Upon arrival at our fishing site we deployed our first ten lines. I looked at my watch, it had taken all of 15minutes to deploy two sets of gear (Note: 1 set=5 drumlines). This left us with plenty of time to enjoy our 10:30am …lunch ? I was ecstatic about my first trip to Broad Key from the minute I heard about it weeks ago, so naturally not much sleep occurred that Friday night. Nonetheless, I woke up excited to begin my weekend with the lovely ladies of OLLA and my fellow RJD interns. I knew that I would be spending the first day in the water with half of the students, and Ms. Taylor, experiencing Dr. Diego Lirman’s coral nursery and surveying the surrounding seagrass. After a short period of organizing everyone’s things at the house, we set off on our snorkeling adventure. We all eagerly leapt into the cool, refreshing waters near Broad Key ready to explore. For several of the girls this was their first time snorkeling, and for most of them it was their first time to be instructed on identifying marine organisms. The girls were very enthusiastic and knowledgeable about the marine environment and did amazingly well! We spent the afternoon familiarizing them with the different species of coral and the names for all of the beautiful, colorful fish swimming past us. Words cannot express how ecstatic I am to be back with RJD for another summer! My love for sharks and this program grow exponentially every time I go out with this amazing research team! Despite the ominous bad weather and choppy seas threatening our trip on Monday, we decided to go ahead and try our luck close to shore, bayside in pursuit of some sharks! We were joined by a group from the Potomac School. They came all the way from Virginia to help us out! In addition, we were fortunate enough to have two gentlemen from BBC Mundo filming, interviewing, and shooting photos throughout the day. Luckily the weather cleared and we were in for a good day! The very first drumline we pulled up had 2.5 meter, male Nurse shark on! We were able to get some nice samples and measurements from him. Three weeks ago I imagined spending my summer at home, in Austin, TX. When I was offered an internship with RJ Dunlap I was ecstatic, as this incredible opportunity seemed to piece itself together nicely. Last Friday was my second trip as a member of the team, which was exhilarating as I was able to be truly involved in securing the sharks and collecting samples. We went to the Everglades National Park with a helpful group of Miami Dade College students and an enthusiastic family that bought a satellite tag, or Hammer-tag. I have been dreaming of going shark tagging for as long as I can remember and last Thursday morning, I was headed down to Islamorada to join the RJD team for a day in Everglades National Park. Besides being a first timer and the chance to research sharks, there were other reasons to be excited for this trip. First, the boat trip was being sponsored by National Geographic for their show Monster Fish with Zeb Hogan. They bought a satellite tag and they wanted a nice, big bull shark (Carcharhinus leucas), to wear it. After meeting up with Dr. Hammerschlag, the RJD team, the Monster Fish crew and Captain Curt, we loaded up the R/V Endsley and headed out to Middle Grounds in hopes of finding the film crew their shark. Shark tagging on World Oceans Day! Driving down I-95 on Thursday afternoon, I couldn’t stop talking to my parents and grandmother about how excited I was to get back on the water with the RJ Dunlap team. Last Friday, I was lucky enough to have my parents and my grandmother, who just happened to be in town, out on the boat for some summertime shark tagging. As this was my only trip for the summer season, I was itching to tag some sharks. Also on the boat were some other University of Miami parents as well as some other guests from around South Florida and a reporter from Guy Harvey Magazine. Many thanks to Susan Gerrish, RSMAS’s Assistant Director of Advancement, for organizing this trip and coming along with us as well! Our team and participants for World Oceans Day! After all the guests arrived, we started up the R/V Endsley and headed to a spot called Middle Grounds in Everglades National Park. I was excited to fish in this spot as it was likely for us catch one of my personal favorite species, the Lemon shark (Negaprion brevirostris). Our first line of the day brought up a good-sized Nurse shark! We performed our usual shark work-up in a swift manner, taking a fin sample, blood sample, and attaching a dart tag. 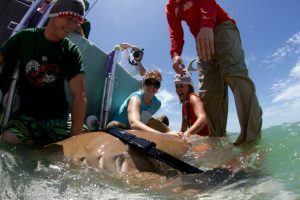 The work-up for Nurse sharks is slightly different from our work-up for other sharks. We do not test their nictitating membrane response, as they do not have this membrane, and their skin is too tough for a muscle biopsy. We sent the nurse shark on its way and moved on to the rest of the drumlines. The next set yielded a small blacknose shark and another nurse shark. The blackness was fairly small and in good condition so the group was able to take pictures with the shark as well as a picture for Guy Harvey magazine with a copy of the magazine. During the final set, my wishes cam true! Along with another blacknose and a juvenile blacktip shark, we caught two lemon sharks! 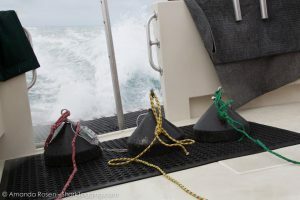 Samples were taken, the sharks were measured, and a dart tag was placed on each shark. All in all, the day was very successful. The group was able to interact with a number of different species and everyone got involved in our work-up process! The group came away with a new appreciation for these beautiful animals and I was reminded why I am so lucky to be involved with the RJ Dunlap Program’s research. I could not have asked for a better day or a better way to celebrate World Oceans Day! /wp-content/uploads/sites/28/2012/06/group.jpeg 641 960 rjd https://blog1.miami.edu/sharklab/wp-content/uploads/sites/28/2018/09/Um-Shark-Research-logo-2018.jpg rjd2012-06-14 08:07:542012-06-14 08:07:54Shark tagging on World Oceans Day! A new RJD record: 11 nurse sharks in one day! From the looks of the weather, the mast academy and the RJD interns didn’t think we were going to have a shark filled day. There were scattered clouds, choppy waters and the group was set out to go to the edge of Hawks Channels where the waters were a bit calmer. Captain Curt, James, David, Julia, Virginia, LeAnn, Fiona, Laurel and set out the first drumlines. The spirits were high and everybody had one thing on their mind, sharks. A couple drumlines were reeled in and the first nurse shark was on the line. The students and interns were able to gather data for the program by taking measurements, a fin clip, and insert a spaghetti tag. We kept rolling in the drumlines and the sharks just kept coming. 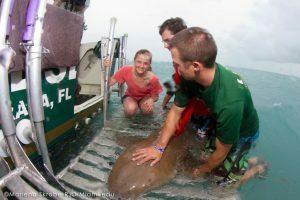 Captain Curt pulls in a beautiful nurse shark so the team and the mast academy students can gather some data. 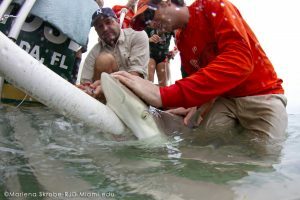 https://blog1.miami.edu/sharklab/wp-content/uploads/sites/28/2018/09/Um-Shark-Research-logo-2018.jpg 0 0 rjd https://blog1.miami.edu/sharklab/wp-content/uploads/sites/28/2018/09/Um-Shark-Research-logo-2018.jpg rjd2012-03-05 14:58:012012-03-05 14:58:01A new RJD record: 11 nurse sharks in one day!